*Please like my new Facebook page for more cheap and simple activities from not only myself but many other wonderful bloggers as well! 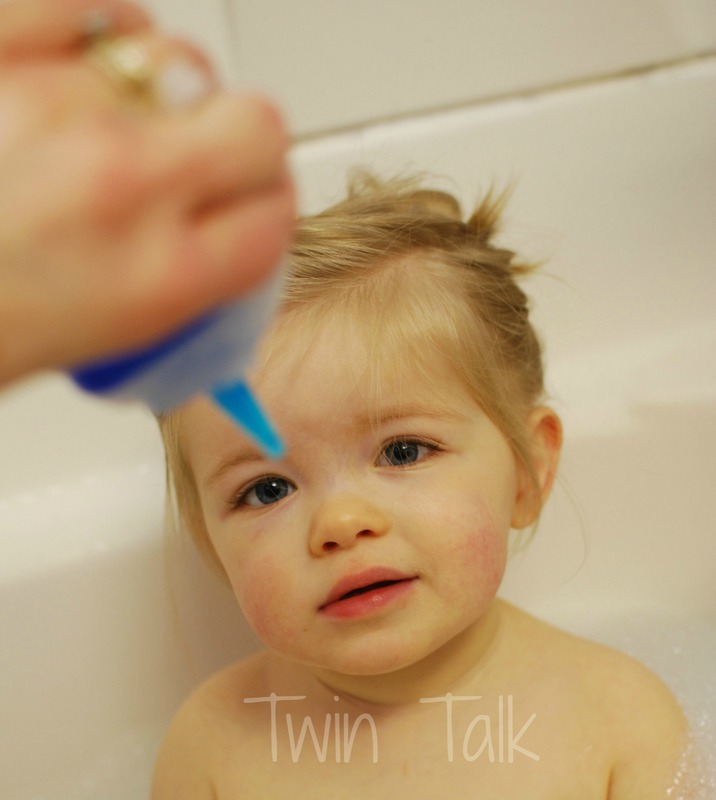 Every Sunday morning, I bathe the twins. Typically that’s my husband’s job, as I run around on weeknights and get jammies out and diapers ready. But on Sundays, we take our time for baths and make it fun. 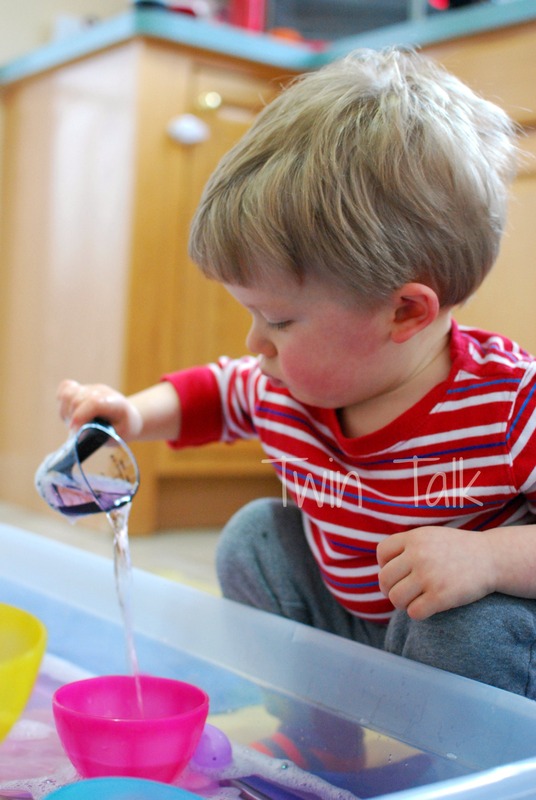 Being who I am, I decided it would be even more fun to introduce different sensory activities that the toddlers could do in the tub. It would change every week, but still be simple and cheap, as is my preference. 🙂 So, a few weeks ago we started “Sensory Bath Sundays”. 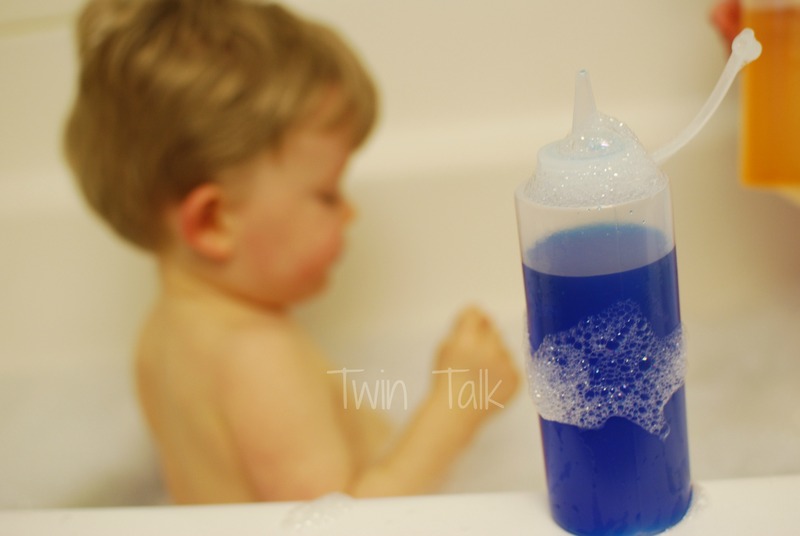 Not every one requires a blog post, as our first bubble bath experience last week was a sensory activity in itself. This week’s, however, was super fun and easy. The twins really enjoyed it so we’ll be sure to do it again soon. 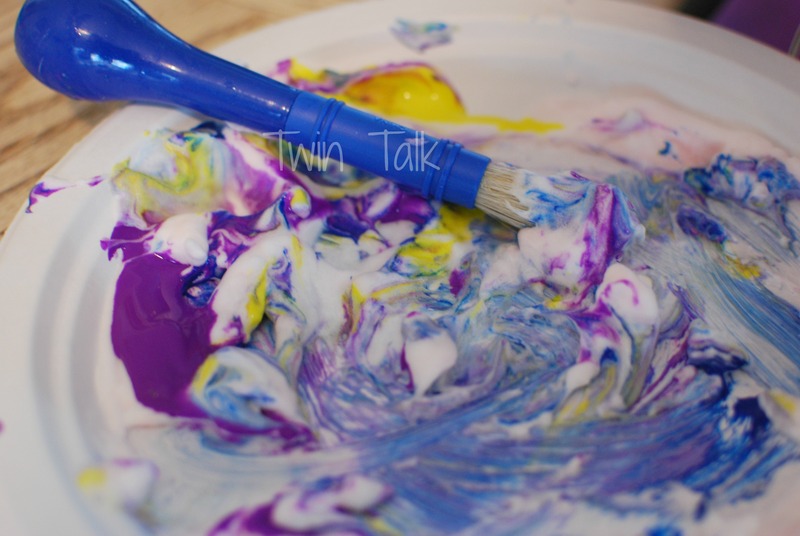 We created water colors by squeezing! Long ago, I bought two restaurant-style squeeze bottles at Walmart for a dollar or two. 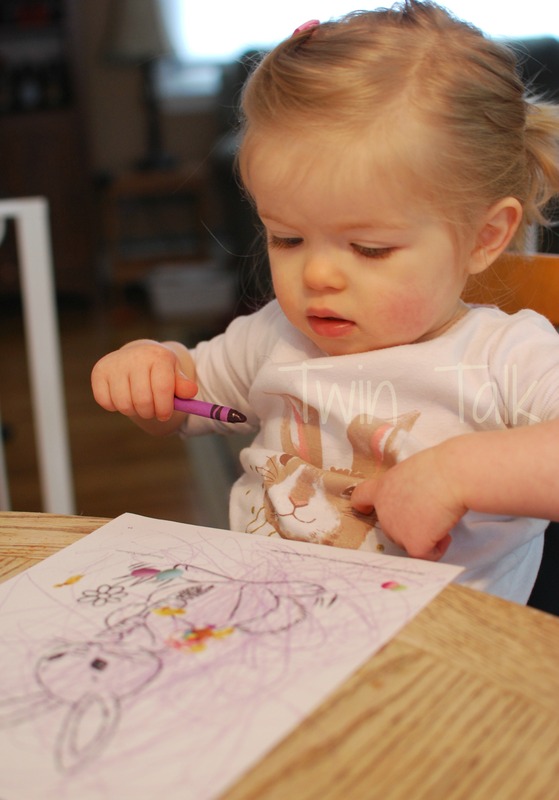 I was glad they were clear (as some aren’t), so the twins could see what colors were inside. 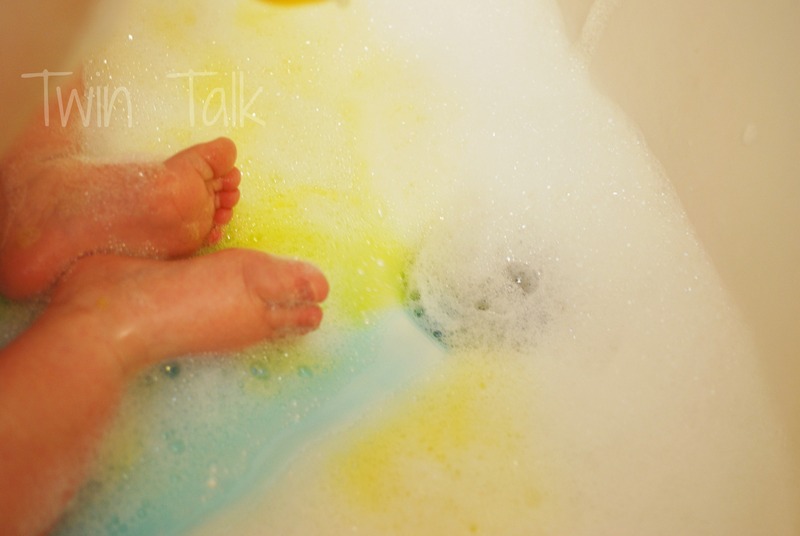 For this bath, I used blue and yellow food coloring mixed with water. As I’ve learned, don’t be afraid to use food coloring in the tub. It doesn’t stain in the slightest, even with the blue looking that vibrant. The twins got it all over themselves and again, no stains whatsoever. 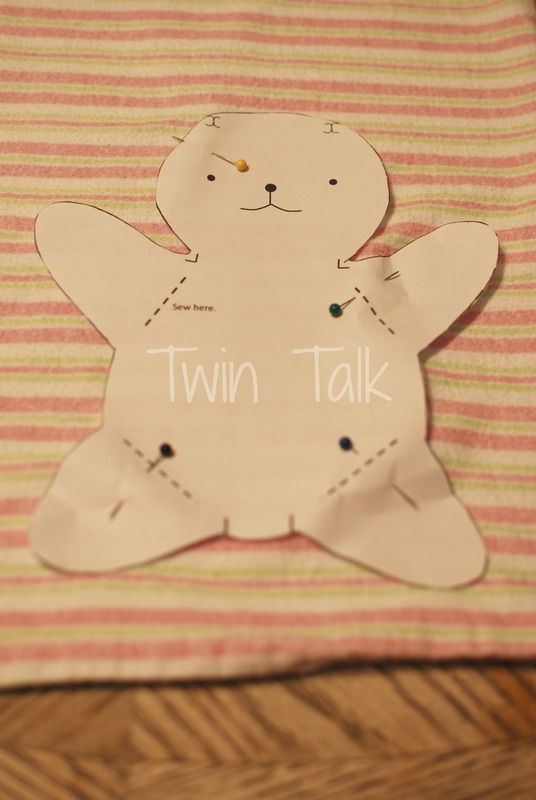 It took a while for the twins to understand what to do, even after I modeled it many times. The strength they needed in their hands to turn the bottle upside down and then squeeze it took some practice. Both toddlers were extremely engrossed in this activity, though only C really tried to copy me exactly, lifting the bottle up in the air, turning it over, and squeezing. 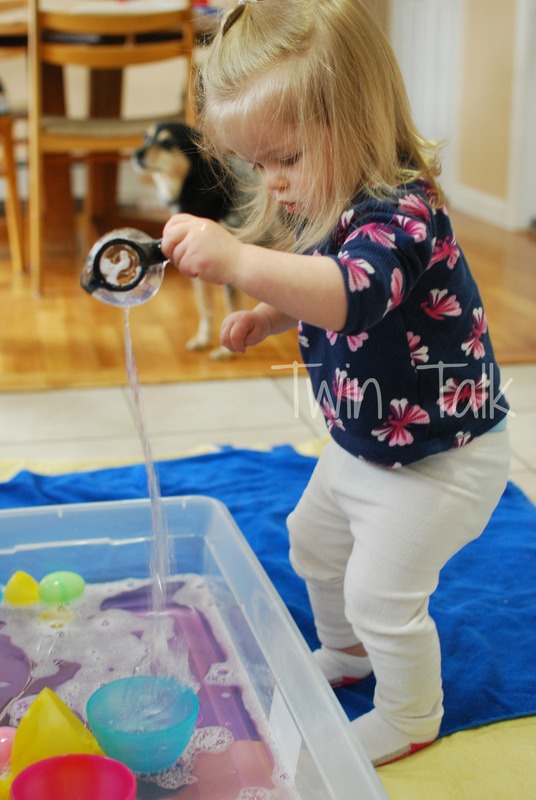 She was more into this sensory activity than probably any other activity we’ve done. She did finally get the hang of it! B also loved this activity, though he mostly let the bottle fall to the side and watched as the drips crept out. They switched between yellow and blue multiple times, and soon enough, we had green water! It was neat to see how one side of the tub’s water with more blue would be a deeper shade of green, while the other side was a lighter hue with all the yellow pouring in. Next time, I’ll switch up the colors! Even as the water drained, the twins loved watching the colors run! I’m very glad we did this one – it couldn’t have been easier and touched upon a multitude of skills! In this house, we are huge fans of cheap sensory activities. Here are just a few of the others we have done: The cheapest, simplest sensory bin ever, our first colored, scented rice bin, and simple snow ice cream! As an FYI – I got this idea originally from an amazing sensory website, Growing a Jeweled Rose. She actually had her daughter spray the colored water with a spray bottle, which really soaked into the bubbles right away. Unfortunately, we didn’t have spray bottles, and with the squeeze bottles we used, the bubbles didn’t soak up much color. The water did though, so perhaps next time I’ll just skip the bubbles! “Free” might be my favorite word when it comes to activities and toys for my 20 month-old toddler twins. They seem to enjoy the free things in our house more than the toys that cost money. Not only that, but I’m really into making things for them that are sentimental – that they can keep for years and years. For example, I painted a song quote on a canvas in their room. I painted the block letters that hang above their cribs. I’ve taken almost every picture that hugs the walls in our small home. And that makes me happy, so I keep doing it. After receiving my sewing machine for Christmas, (mine is similar to THIS one) I took up sewing and knew I’d want to make toys for the twins, like these buckle pillows. When I saw this project, I knew I had to make it. See, it’s almost Easter. 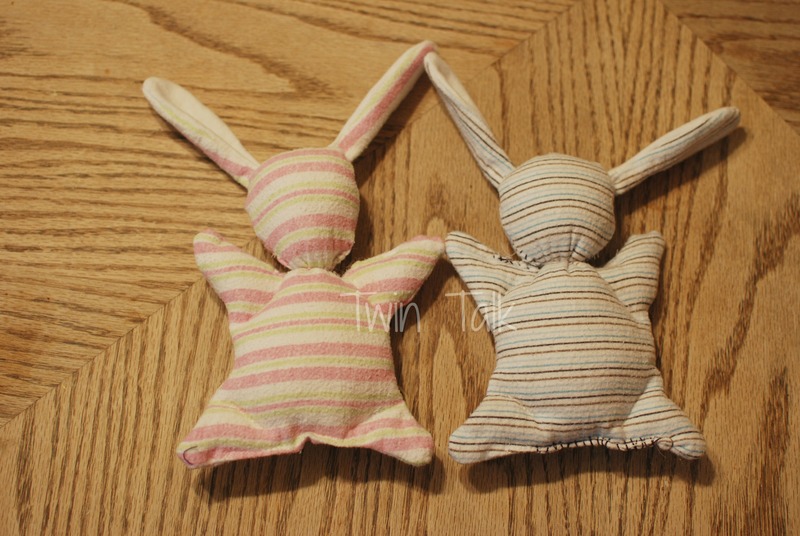 These bunnies would make a great Easter basket gift. 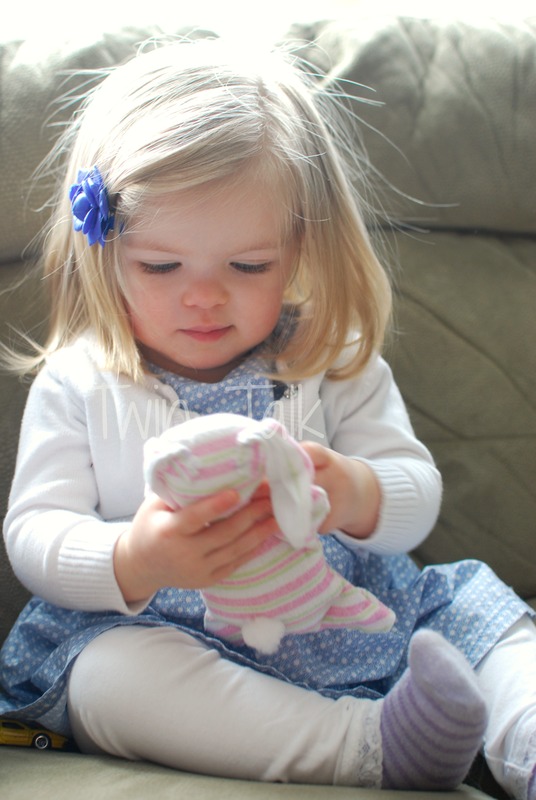 My real inspiration, however, was my daughter C, who is currently going through a “bunny phase”. 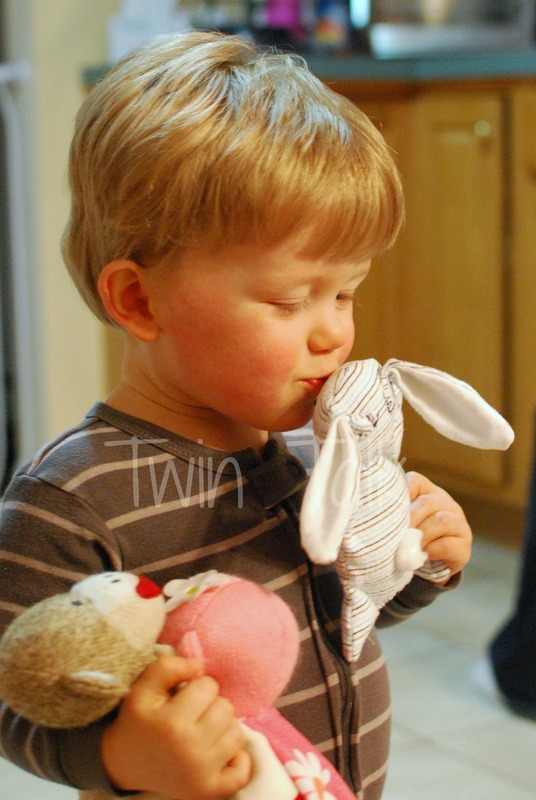 She loves bunnies, pointing them out wherever she can find them and kissing them to death. 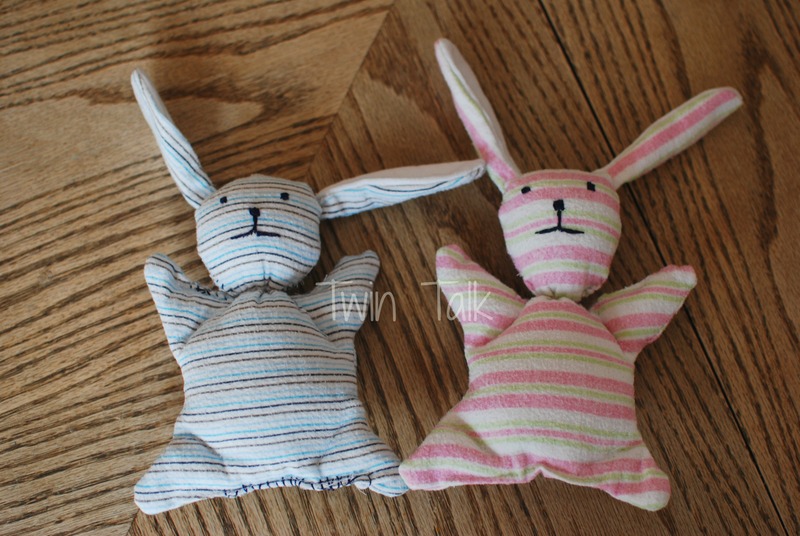 I had wanted to buy both of my kids stuffed bunnies for Easter but nice ones were super expensive. Again, this was the perfect project for me. 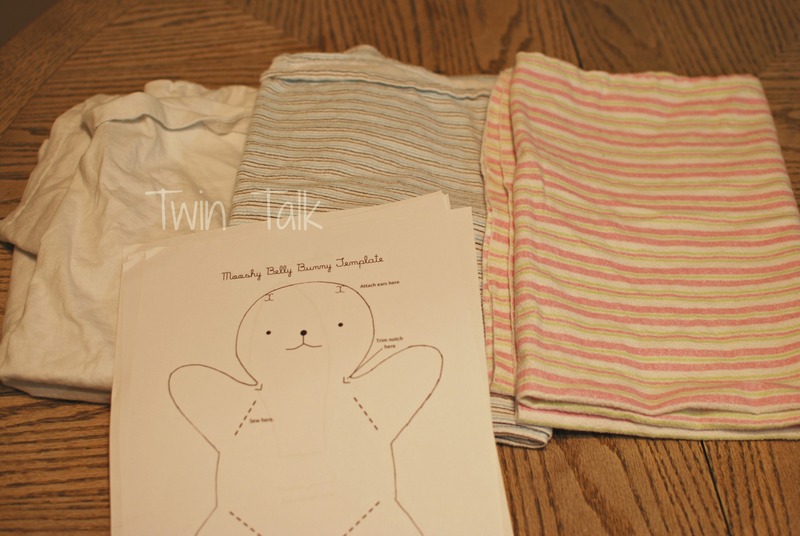 The original idea is called “Mooshy Belly Bunny” and is completely adorable. Holly even provided a handy tutorial that I printed out, and she claimed that beginner sewers would be able to churn out a bunny in one hour. I held on to that hope, envisioning this post being written a week ago. However, that did not happen. I am a really beginner sewer and to be honest, this project took me a week and a half, working on it only at night. I was happy to have it done, though I’m very pleased with the result. 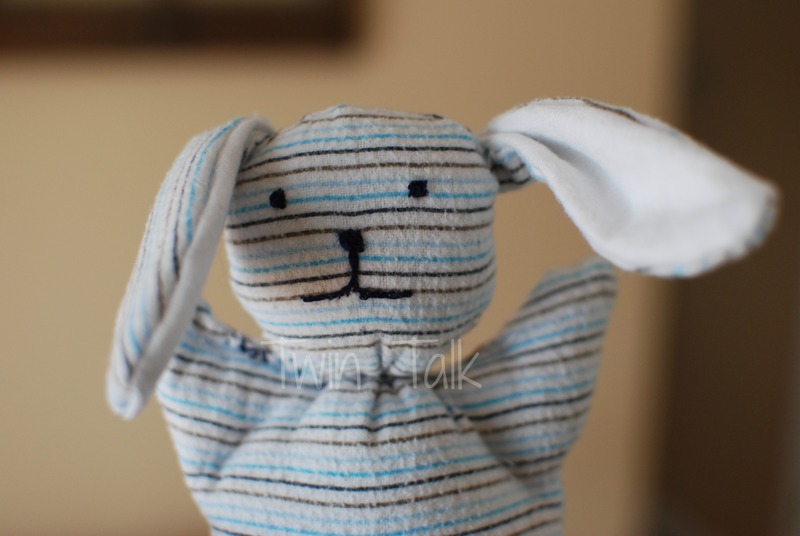 The original bunny was made from a child’s old shirt, which I thought was wonderful and sentimental. While combing through my bags of clothes, though, I came across the twins’ old blankets, and knew that I would use them instead. 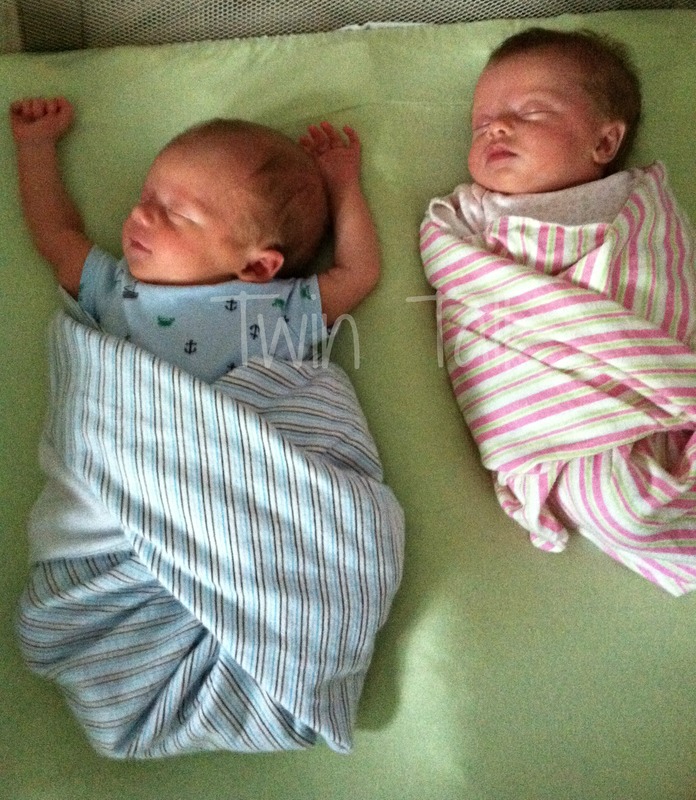 The twins, born five weeks early, were constantly snuggled up in these blankets as all babies are. I still can’t believe they were that small, and revisiting these pictures makes me yearn for that age again (even with the lack of sleep). Yes, these blankets were perfect for the project and if I were to ever do it again, I would stick with the baby blanket theme. First of all, definitely print out the tutorial before starting. It’s very helpful! The templates provided were great, and after gathering the blankets and my husband’s white t-shirt (for the insides of the ears), I got to work. 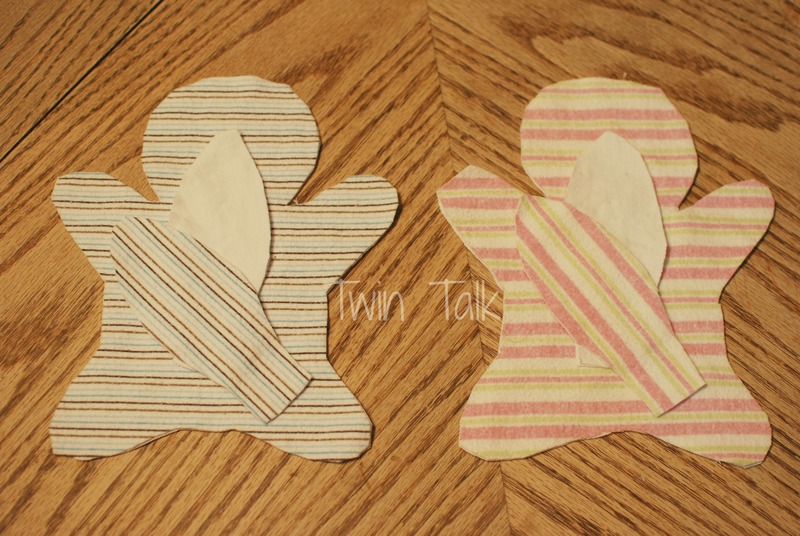 Of course, I began by pinning the templates to the blankets and cutting each piece out. Then I sewed around the edge of the bunny body, leaving a small section open for stuffing. Many days later…at this point I was in the home stretch. 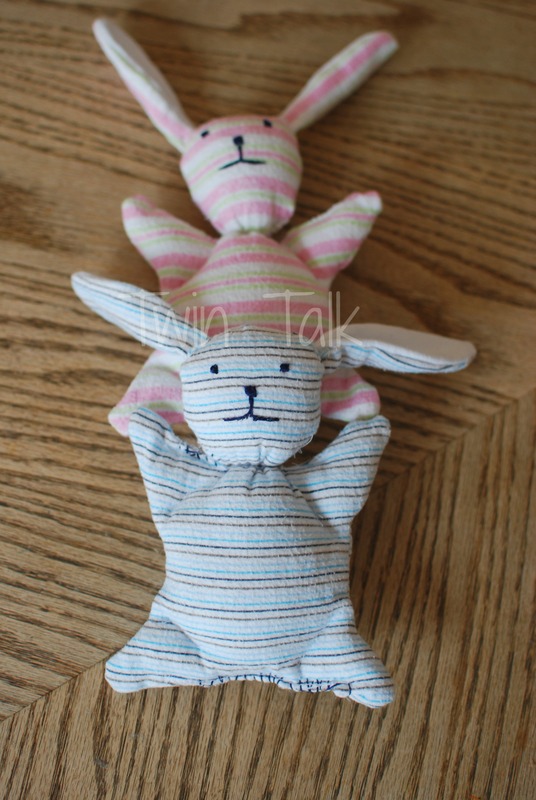 The bunnies needed a face and a tail. The tail (not pictured) was a simple white pompom, attached with a needle and thread. The face was embroidered using a satin stitch and a split stitch. YouTube videos came in handy here, and they came out pretty good! When they were all done, I had two cute little bunnies! I have to admit, I made many errors. Many. They don’t quite look like the original. I think B’s bunny came out better than C’s, which was a little disappointing as she’s the bunny queen right now. However, I doubt my toddlers will notice (or care). Not only that, but the fact that I’ve dug out their old, worn baby blankets and turned them into something they can snuggle at night (that was free!) really makes me happy. I hope they keep these bunnies around for many years. UPDATE: Since giving the bunnies to the twins on Easter, they have fallen in love! The bunnies have become an additional lovey for their cribs at nighttime, which makes me happy. Please like my Facebook Page for more DIY, budget-friendly activities, toys, and crafts from not only myself but many other bloggers as well! 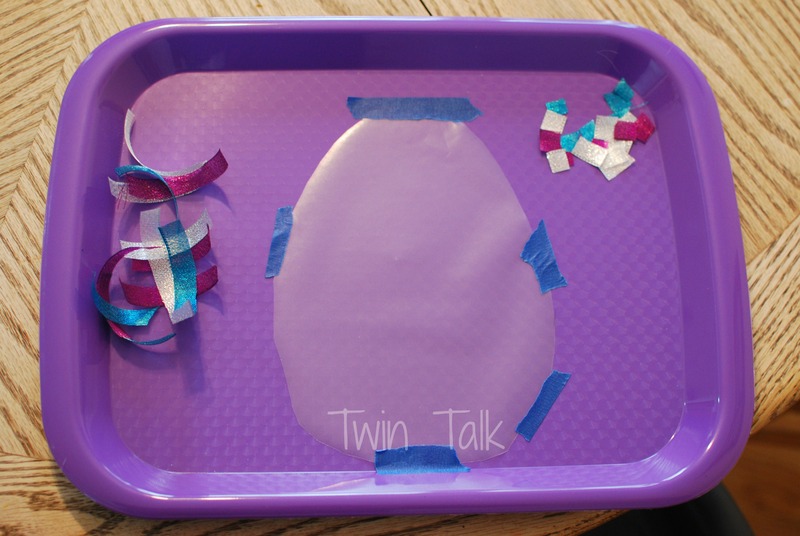 2 Easter Egg Crafts To Do In A Pinch! 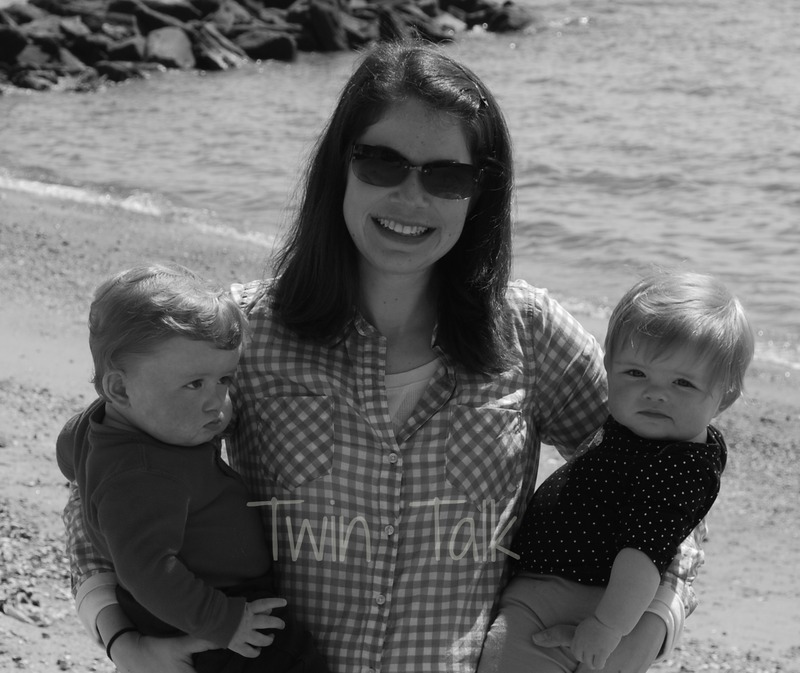 I love to blog about kid activities and I’ve been a bit quiet this past week because I’m finishing up an awesome gift for my twins for Easter. One that the tutorial informed me would take an hour, and because I’m not crafty, is actually taking me a solid week, working on them every night. SO, I had every intention of blogging about them way before Easter, in case anyone wanted to try and make them too, but I’m still not done. Tonight’s not looking promising, and tomorrow night isn’t either. But soon – hopefully Monday night! Anyway, every Saturday morning my husband goes to work. Every Saturday morning I kick myself for not planning something fun to do with the twins while he’s gone, because with a nanny at our house, they’re used to playing with their same old toys all week long. Weekends are for trying new things. So as they got up this morning, I scrambled to find a few Easter crafts that weren’t too complicated (as art isn’t exactly my thing), didn’t require a trip to the store, and still would be cute. I found one that was perfect – marbleized eggs. 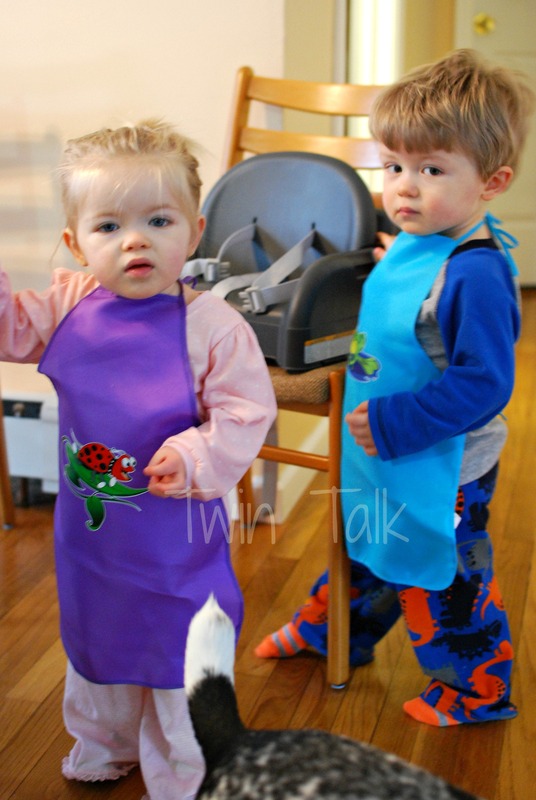 We had all the required materials (except card stock), so after breakfast I got out the twins’ dollar store aprons and we got started. 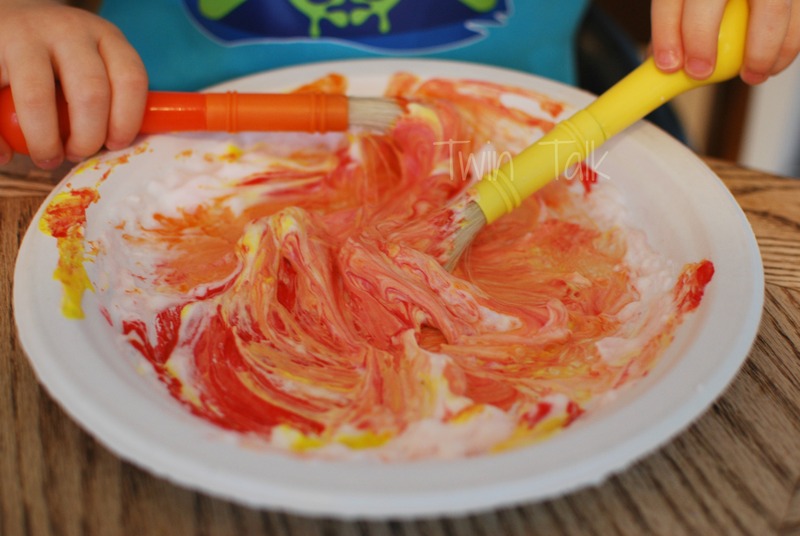 C got started using both brush ends and we were on the right track to a cute Easter egg craft. The colors looked promising! B’s plate looked all nice and swirly as well, creating very cool color combos and textures. 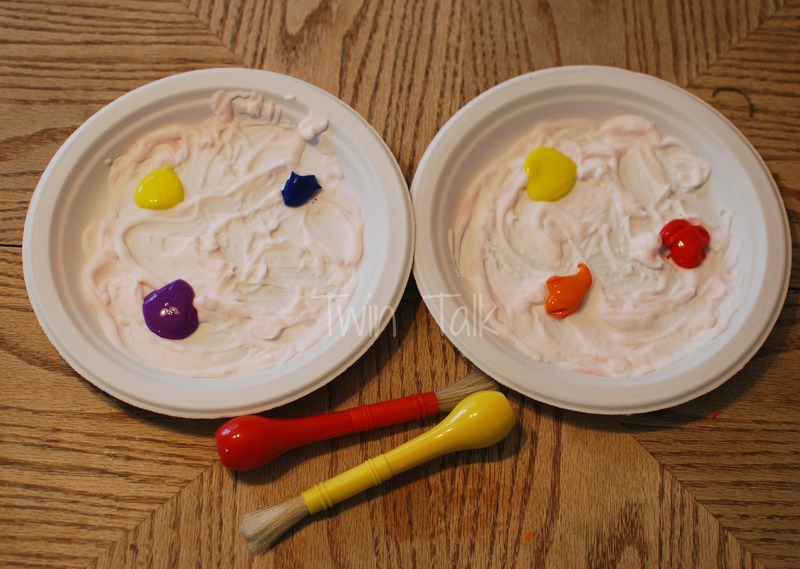 They both enjoyed the stirring process, though they didn’t like paint on their hands. 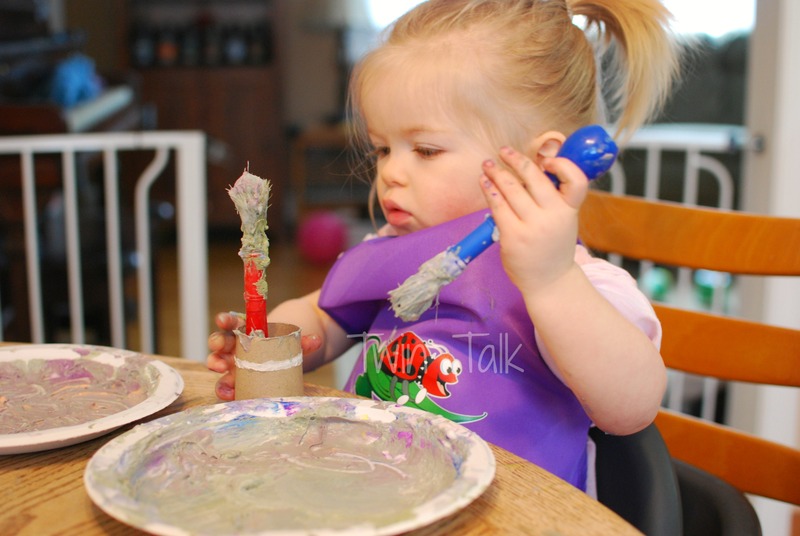 I think we need to be messy more often! And she had a plate of mud. No marbleized Easter eggs here. Oh well. I hung them up anyway and slapped some ribbon on them, so they would avoid looking like round poop circles. 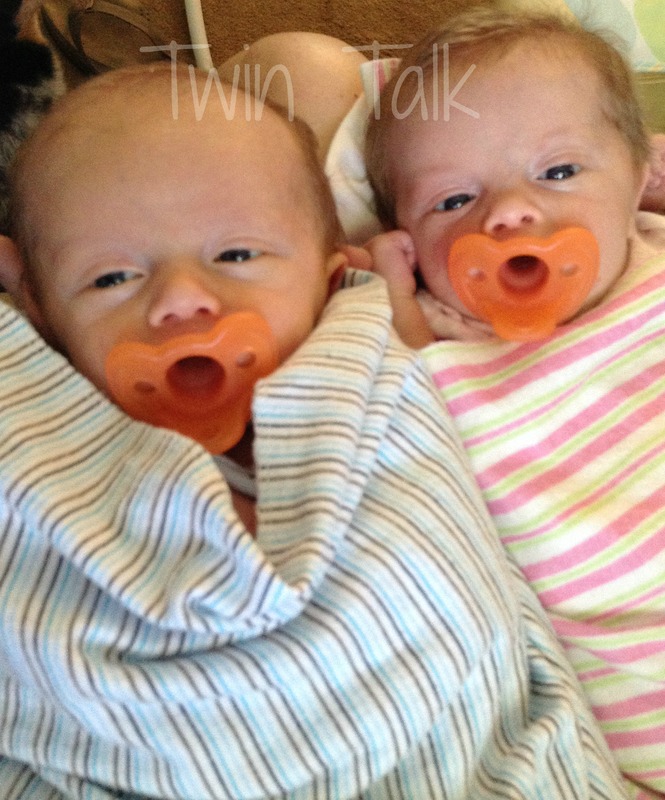 Certainly not like the original, but the twins don’t seem to mind. A little while later, we came back to the table for round 2. 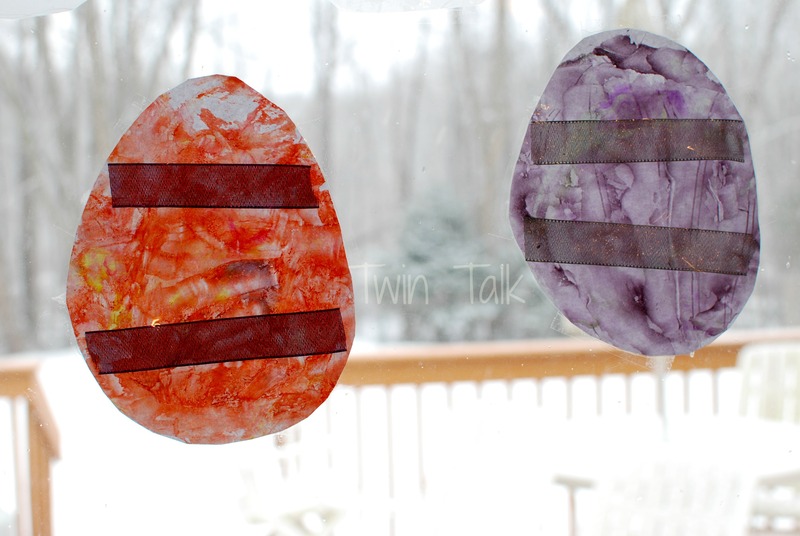 This was simpler and I just thought of it on a whim, as hanging these “marbleized” eggs on the slider reminded me of when we hung our Valentine’s sun catchers there. I got out the contact paper and some leftover ribbon from my DIY buckle pillows and set up two tot trays. Simple enough – stick the ribbon to the contact paper, shaped like an egg, then cover it with more contact paper when it’s done and voila. 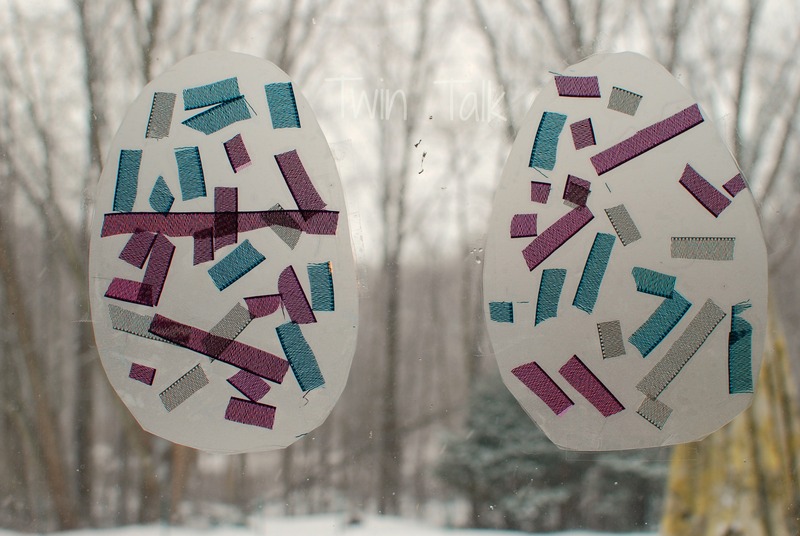 Contact paper sun catchers. And so we did. Well, C did. B didn’t care for the texture for whatever reason and so he happily enjoyed tossing each ribbon off the table one by one. It produced many big laughs as he watched them spiral to the floor. C got the hang of it, pressing and sticking her ribbons to the contact paper. After they were done, I took care of the rest. Not our finest work, but in a pinch, the twins made two easy Easter egg crafts and had a great morning! In the last week or so, we’ve been in full Easter egg mode. 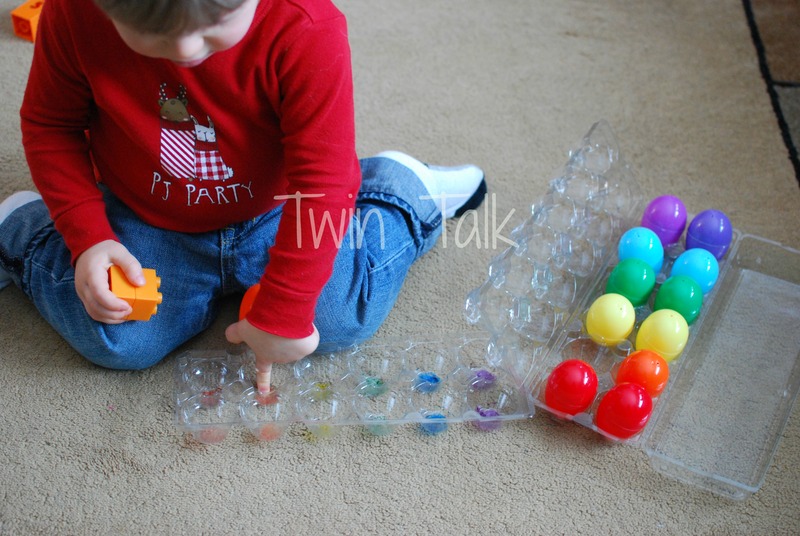 These eggs are such versatile toys – you can use them for so many activities and games for babies, toddlers, or preschoolers. 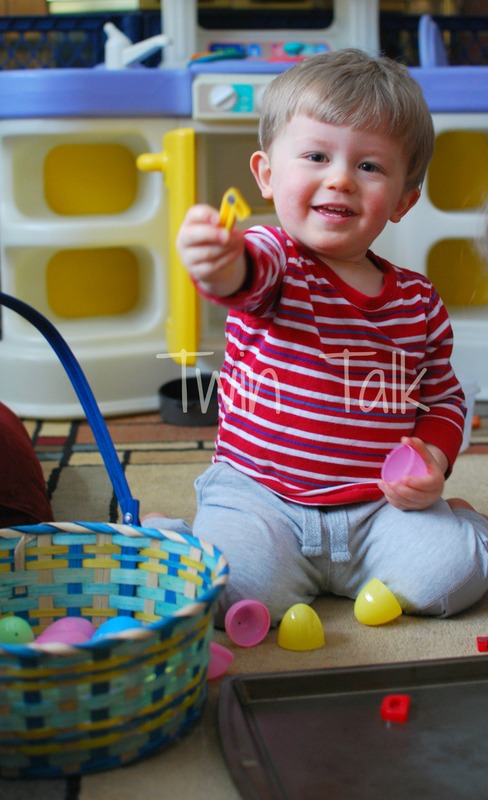 We use them year round, though I’ve put together six activities in particular that are free (assuming you have the eggs already), simple in concept, and easy to set up. The twins did the six over the course of a weekend and loved them all. 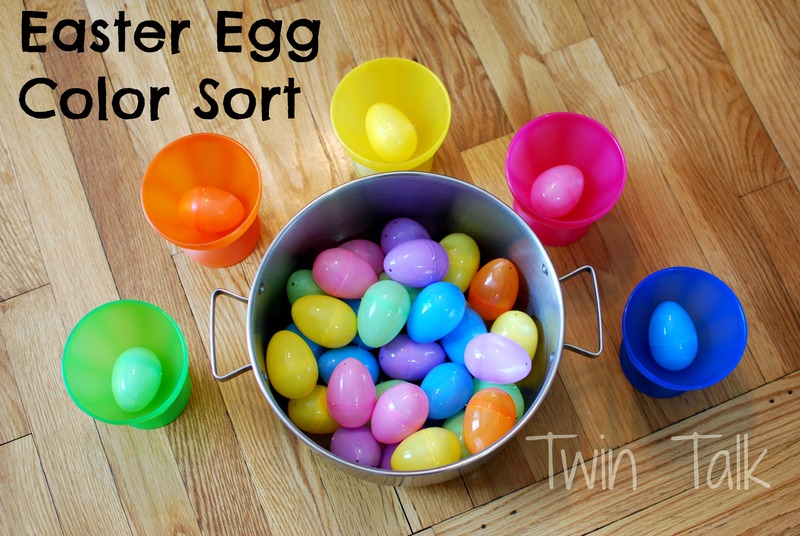 Part 1 of our six Easter egg activities can be found here, where we played an alphabet identification game, had an egg race, and practiced sorting by color. 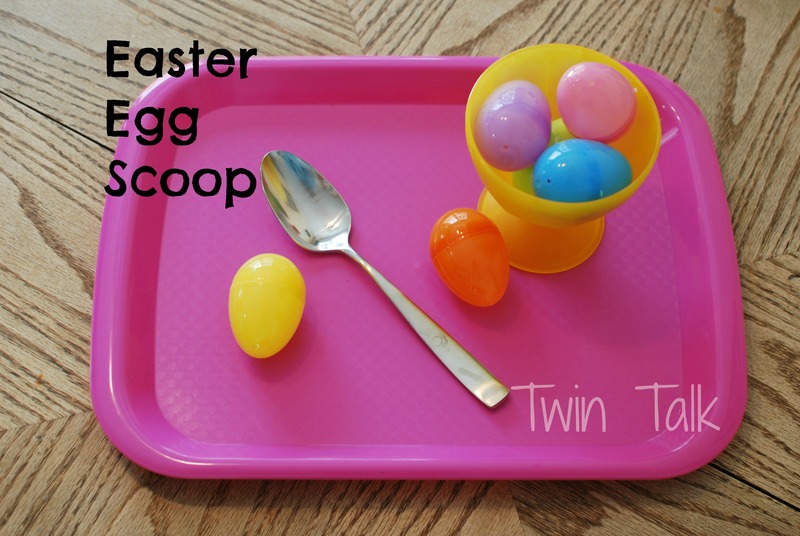 This time, the twins enjoyed some scooping practice, a water sensory bin, and sorted with the help of an old egg carton. This was a “throw together last minute” activity that actually worked out well. 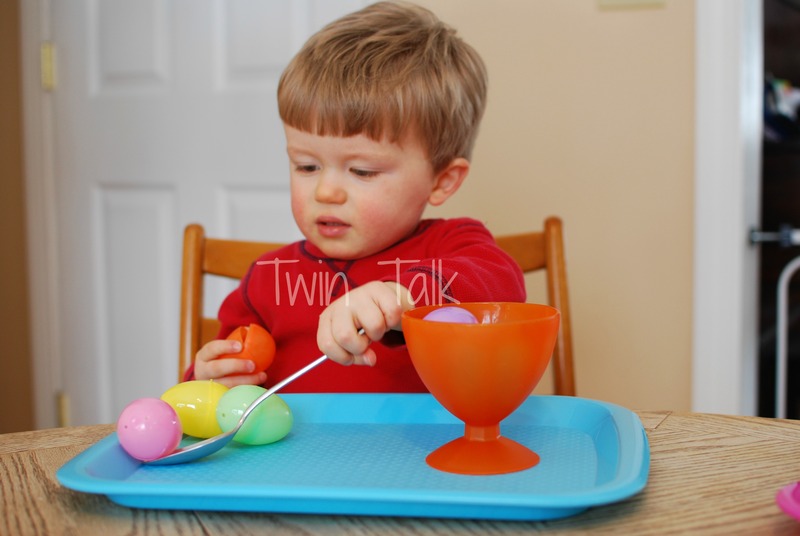 The twins were antsy, and I quickly loaded up two trays (similar to THESE) with some eggs, a plastic ice cream dish (like THESE), and a tablespoon. The original goal was for them to practice scooping up the eggs with the spoon and dropping them in the cup. C had other plans, and enjoyed opening and shutting the eggs multiple times. B did try scooping though. 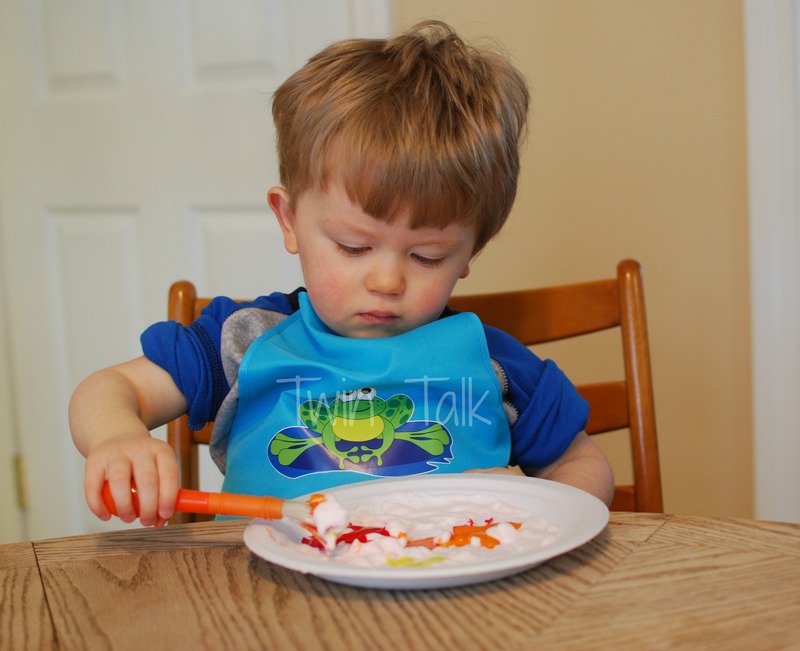 The lip of the tray helped him in scooping up an egg with the spoon, though in retrospect this activity would have been easier if the eggs were in a bowl of some kind, not a flat surface. Oh well – they got the challenging version. B is persistent when he wants to do something, and was successful in scooping and bringing them to the cup a few times. He had a good time, even though it was more challenging than I meant it to be. 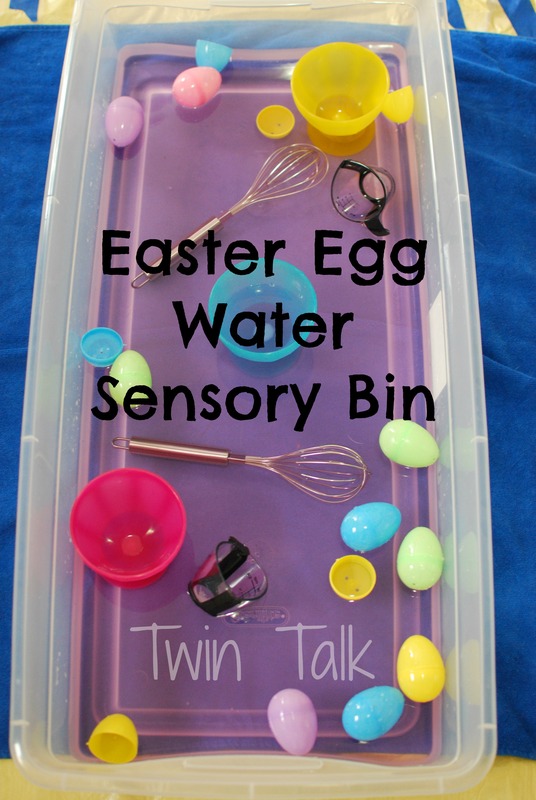 Our Easter egg water sensory bin, as with all water bins, was a hit for the toddlers. I added a few drops of purple food coloring, some eggs, and some other tools. After they got started, I also added a little soap for a few bubbles. Not a complicated concept by any means, but the eggs had these little holes in the bottom that made it fun to scoop water and pour from. Pouring practice is all the rage in our house right now. They can’t get enough of it. They enjoyed this water bin for a long time! 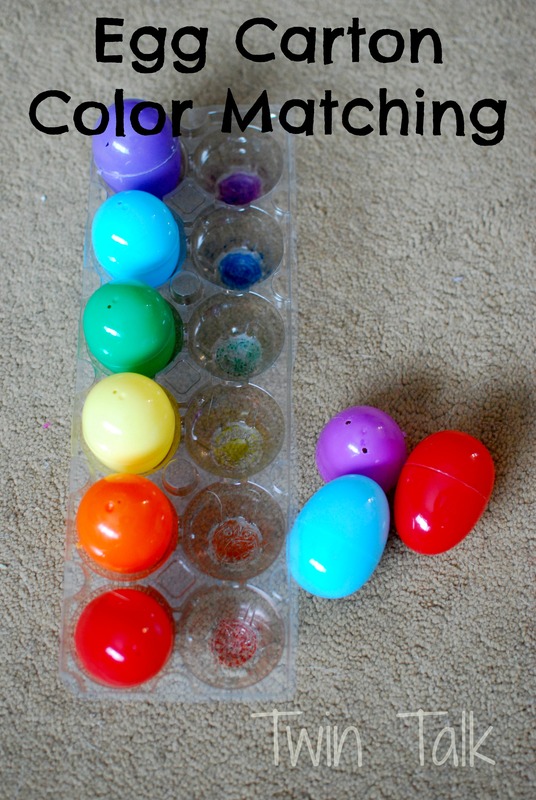 This last Easter egg activity was unbelievably simple, like so simple I can’t believe I hadn’t done it sooner. I’ve had these eggs for a long time now, sitting in an egg carton. One night I grabbed some markers and simply colored the bottoms of the carton and let it dry overnight. 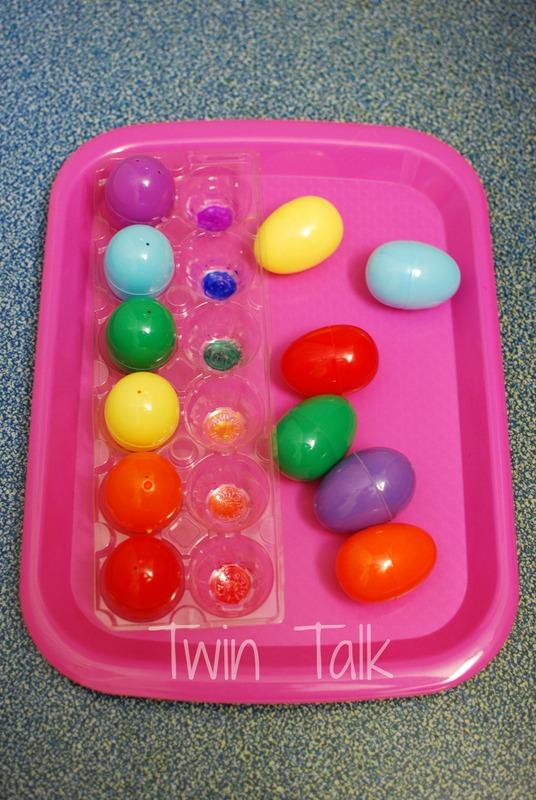 The next day, the twins got their eggs and put the eggs in the corresponding spots that matched the color. I couldn’t get too many pictures because this one was a little too easy for them – they had the eggs in correct locations in about 30 seconds, and they weren’t too keen on repeating the game more than once or twice. However, it would make a great travel activity as it’s portable and easy! The only thing I would recommend is to use a cardboard carton, not plastic, as the marker didn’t stick too well. 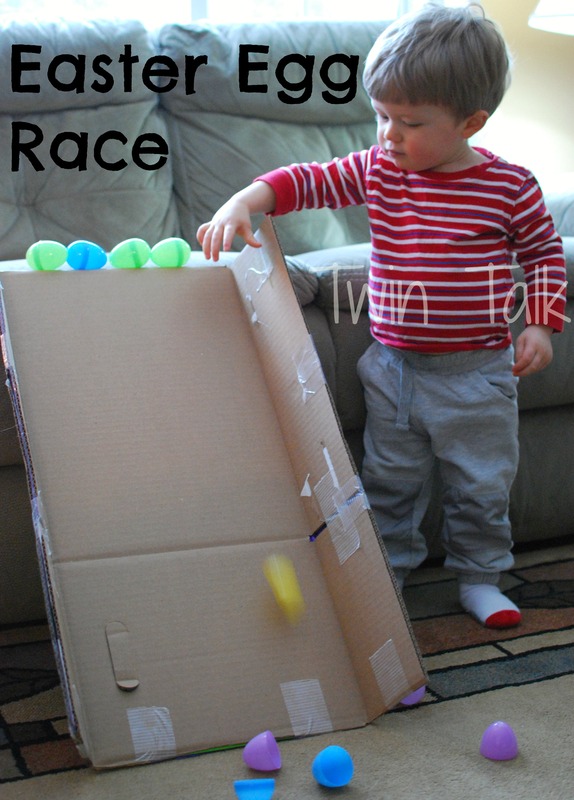 My goal was to find Easter egg activities and games that were simple and cheap – and all six of them fit the bill! I’m on to something slightly more complicated (though still cheap) next. It might involve my sewing machine – we’ll see if I don’t change my mind! As you know, I’m all about the cheap and easy around here. I need activities that don’t cost much money to create, because the twins go through activities every hour and I’m not that rich. But I also need activities that don’t cost too much of my time, because I’m working full-time and I don’t have any minutes to spare. What we do have in my house (with PLENTY to spare) are Easter eggs. We have SO many of them. They’re kind of the best toy around, I think. After pompoms, of course (I need to do a round up pompom post!). There’s just so much you can DO with Easter eggs, and they’re really quite inexpensive (get a big batch of them HERE). So last weekend I went on a mission to play with the eggs for two days straight to see how many cheap, simple games we could play. As Sunday drew to a close, we managed to squeeze in six activities – with many more we could have done. 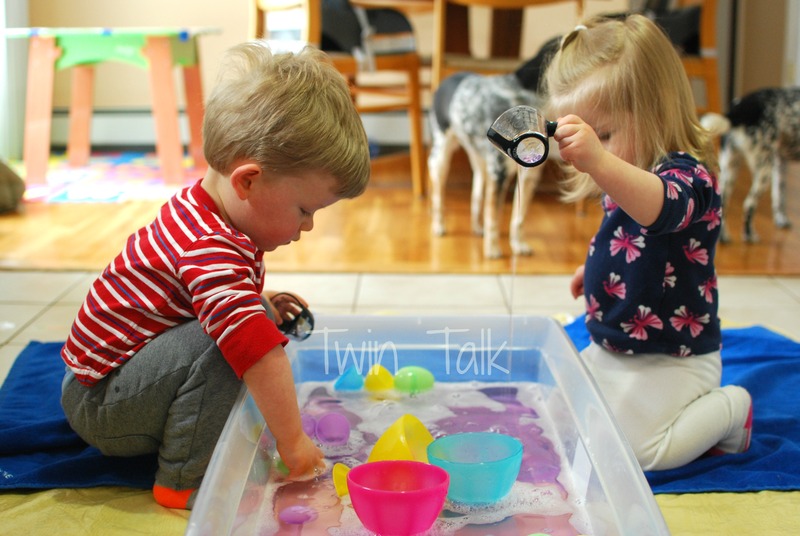 I geared these activities towards my twins’ age, 20 months – but honestly, you can practice reading and math skills for older kids with the eggs and babies can play with them as well. 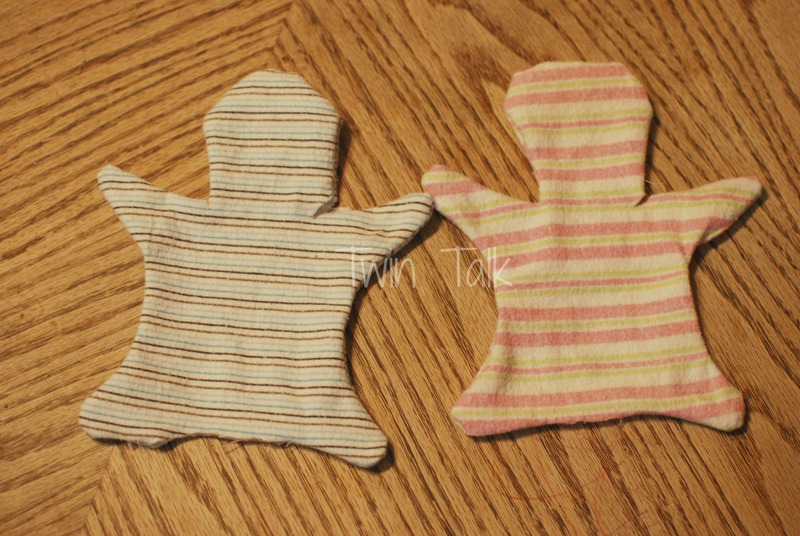 They’re a very versatile toy that should be used all year round. Instead of bringing you all six in one post, I’m splitting them up, three and three. 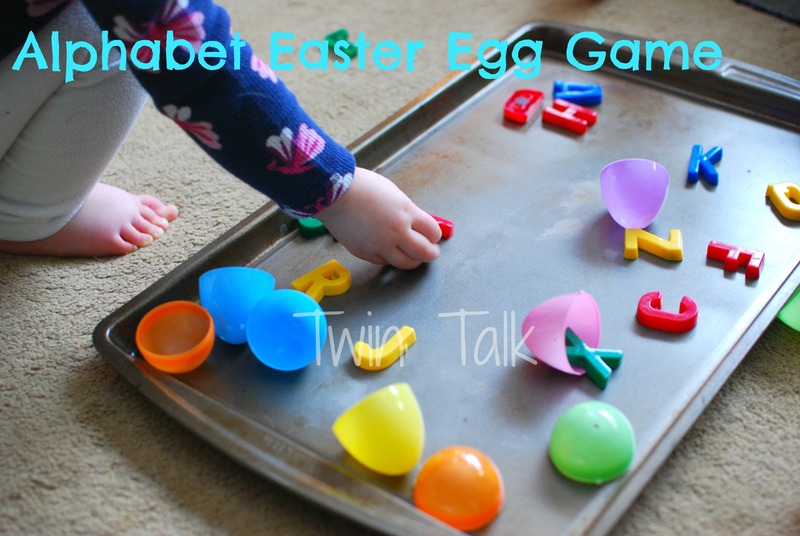 This is Part 1 of the no-prep games we played with Easter eggs. Part 2 will be coming soon! This game was unbelievably simple, fun and FREE. 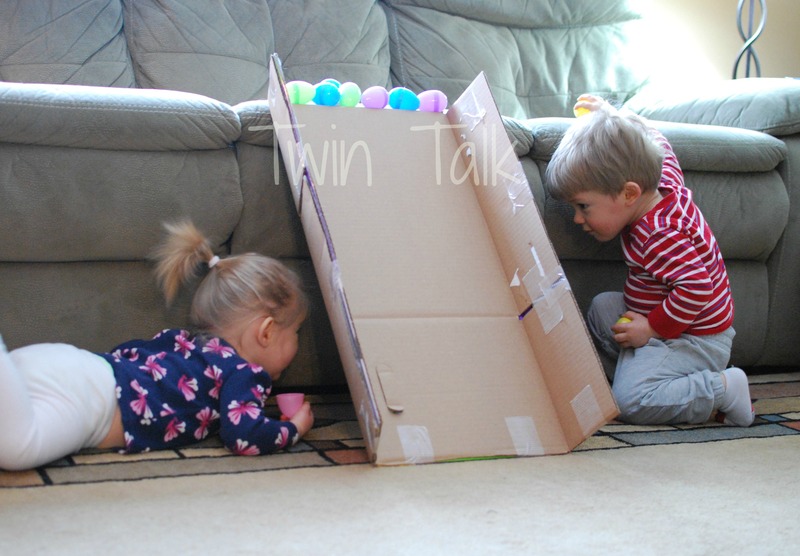 The twins never had a ramp before, and even after it was used for eggs, they sent their cars, blocks and balls down to see what would happen. I got the idea here, and we modeled it pretty close to the original. I dug in the garage and found a sturdy old box. My husband kindly folded down and taped the sides, so the eggs would slide straight down the box. 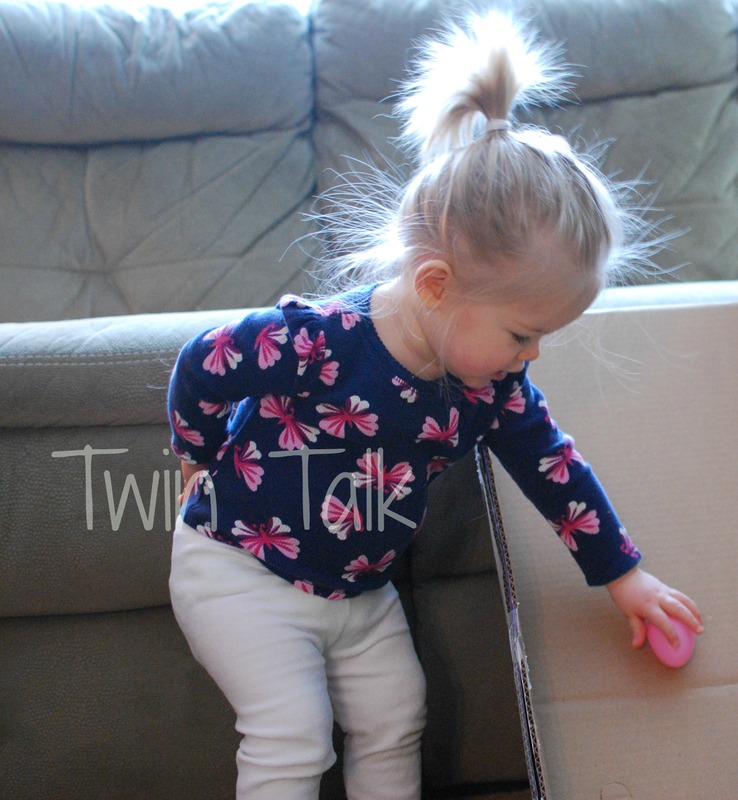 Then I set it up against the couch, gave the twins the eggs and let them play. It took them a few minutes to figure out how it worked, but once they got it, they thoroughly enjoyed letting the eggs sail. Such a simple concept, and sometimes those are the ones that are the most fun! Even after they got tired of racing the eggs, they practiced their newest skills, under and over. Since the weekend, the ramp has a permanent location in our toy area. Another FREE activity that needed NO prep time whatsoever. It happened by accident, actually. I was getting set up for something else and then the twins asked for a pot. I tossed in the eggs and remembered I had some plastic ice cream dishes in the basement. 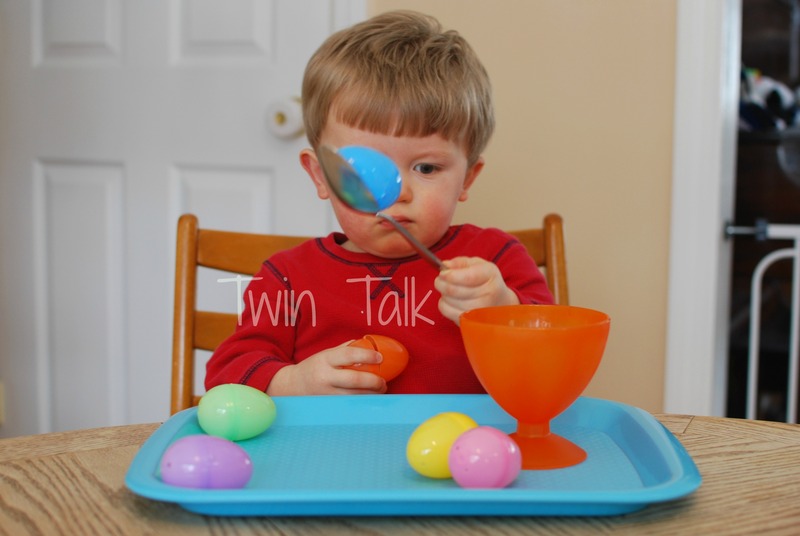 The cups matched the eggs and an activity was born. 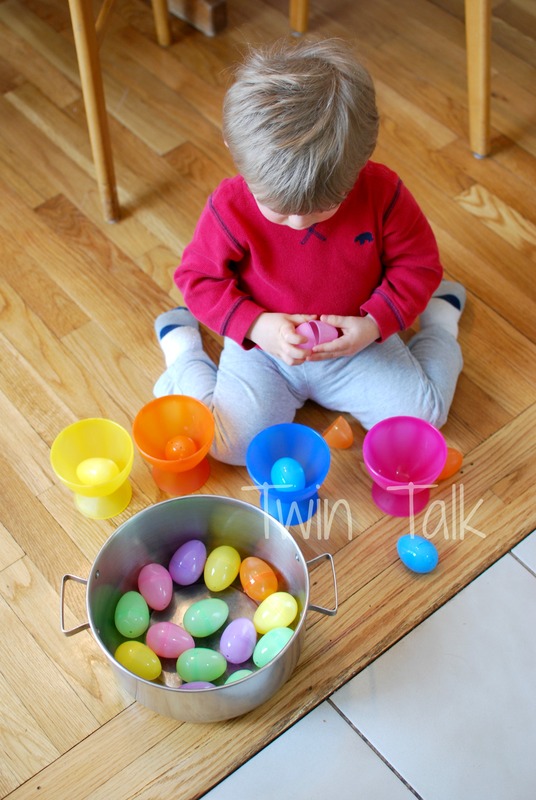 I put out the cups and asked the twins to help put the eggs in the cups. They did the rest! C delightfully pondered which cup to put the eggs in, and as she did so I’d ask her to name the colors. 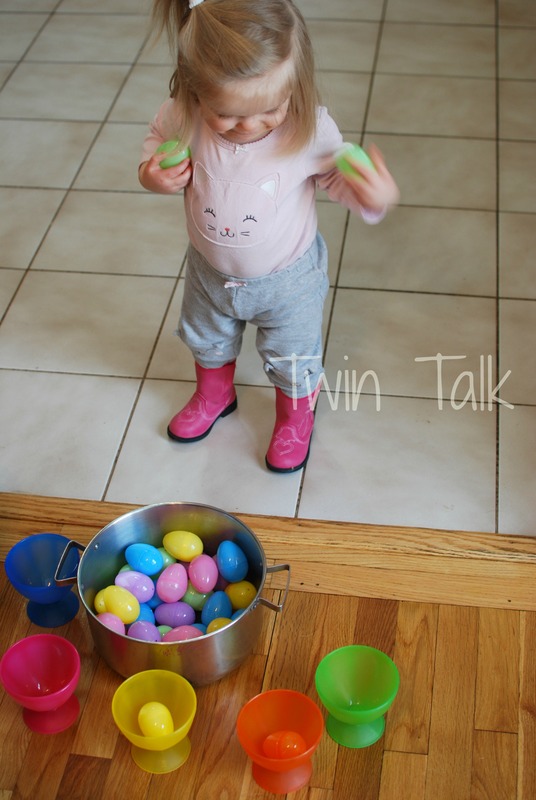 I’m finding C is really into gross motor activities, and she loved dancing around the pot as she chose her eggs. 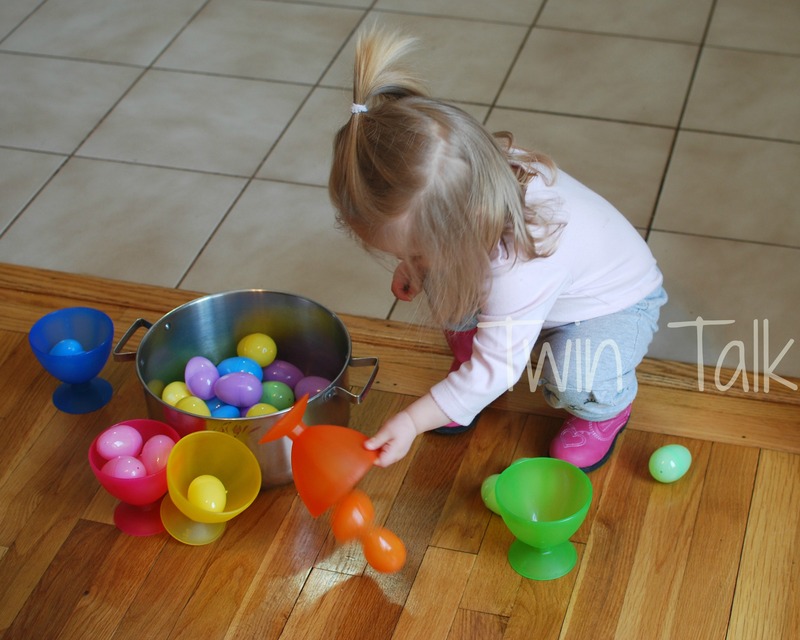 B enjoyed opening and closing the eggs (a great fine motor skill, even for younger toddlers! ), and then sorting them into the cups. After the cups were filled, C dumped them and started over again! This third (FREE!) Easter egg activity we did involved about two minutes of prep time. I first saw the idea here. Another set of toys we aren’t in short supply of are magnetic letters. We must have at least 3 sets. HERE’s a 72-piece package that’s super cheap! It’ll hold you for a while! I pre-stuffed the Easter eggs with the magnetic letters and then grabbed a cookie sheet. 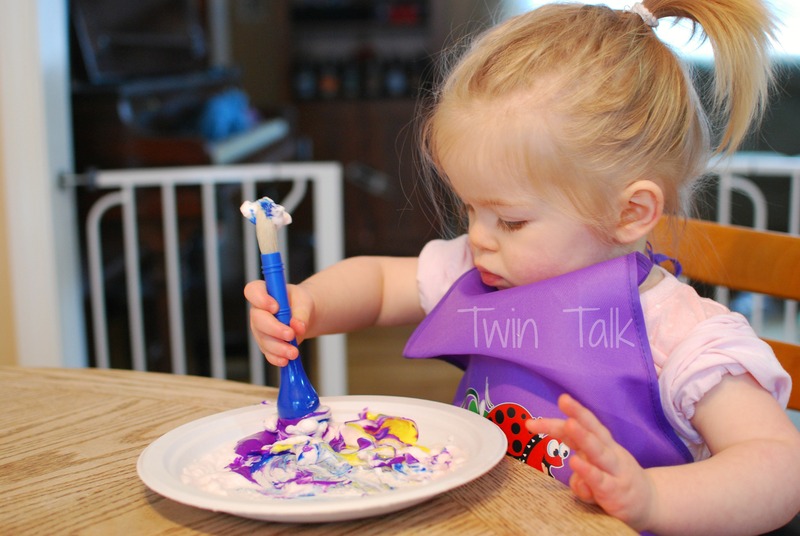 This activity was fun and educational for the twins on a few levels. 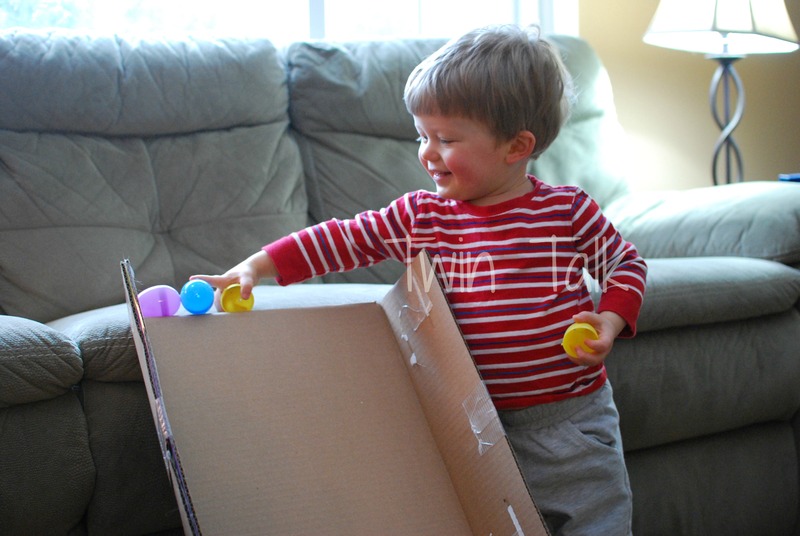 First, they loved opening each egg and being surprised by the letters they saw. Of course, they had to shout out what they found. 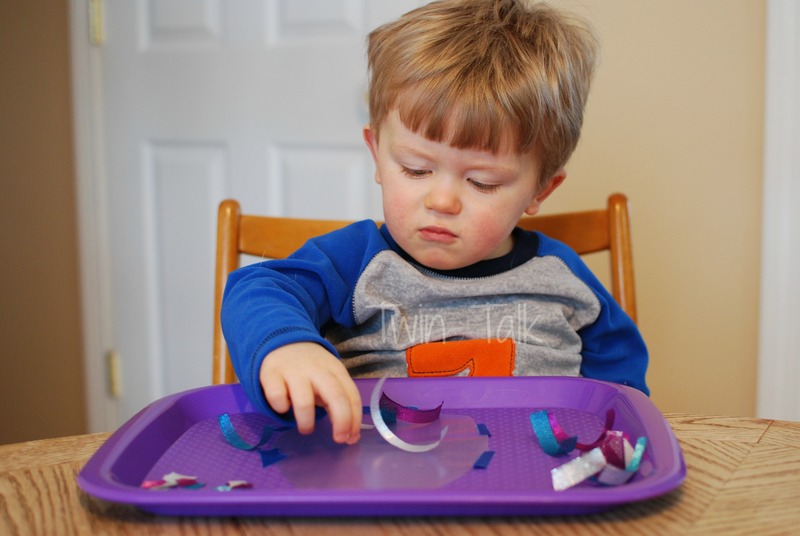 Now, this activity could be modified – if your kids didn’t know their letters yet, or getting their letter practice on was too easy, you could stuff the eggs with a variety of other things – like cut out shapes from construction or foam paper, colored circles to review colors, individual beans to count and sort, etc. 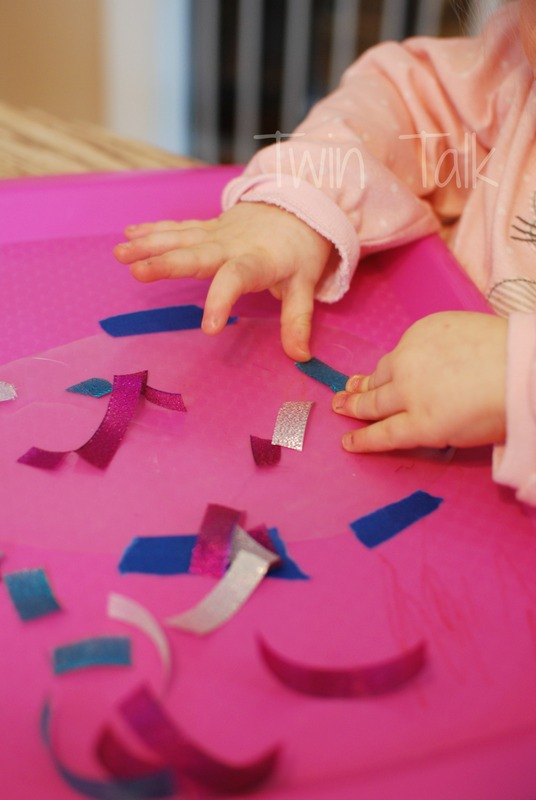 After the twins shared what letters they had discovered, they enjoyed sticking their letters onto the cookie sheet. 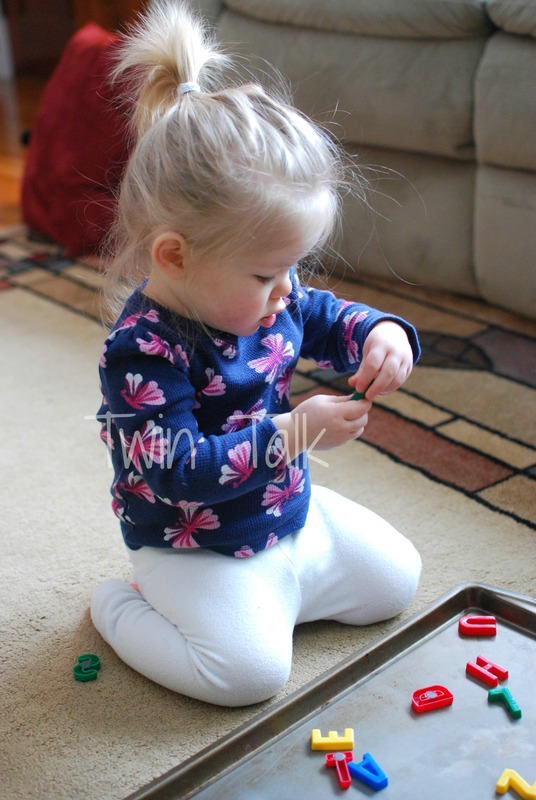 Toddlers love magnets! 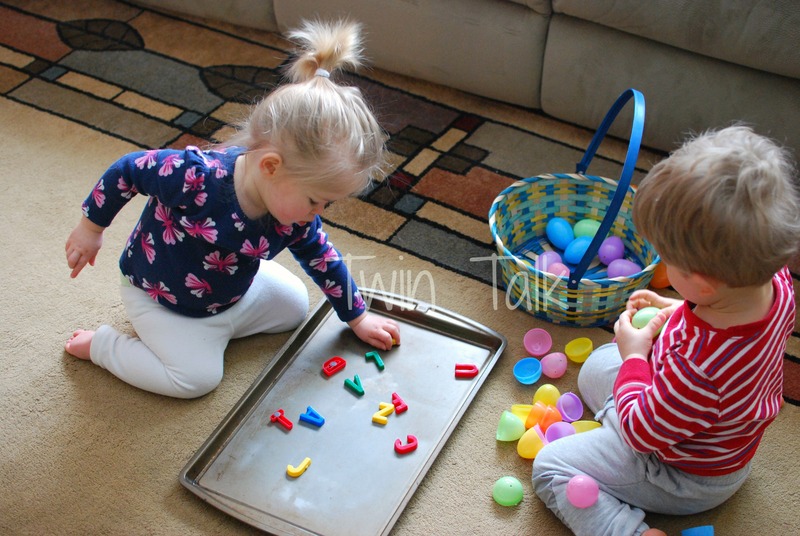 After they emptied all the eggs, I would go and refill them as they were playing with the cookie sheet. I have since separated out 26 eggs and stored them, stuffed with letters, in a separate bag so that whenever we travel to a relative’s house, we can just bring the bag all ready to go. As I said, these were three of the six Easter egg activities we did over the weekend. All were a success and could be done year round! Stay tuned for Part 2, and if you haven’t already, come over and like my new Facebook page. 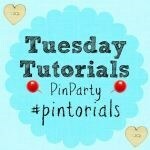 I post not only my own activities but also the best toddler crafts and activities from around the internet!